Attention Deficit Hyperactivity Disorder: Pathophysiology and Design of New Treatments (S.A. Glase, D.J. Dooley). Ionotropic GABA Receptors as Therapeutic Targets for Memory and Sleep Disorders (M. Chebib et al.). Melatonin Agonists for the Treatment of Sleep Disorders and Major Depression (L.R. Fitzgerald, J.E. Reed). Recent Advances in Therapeutic Approaches to Type 2 Diabetes (Ramakanth Sarabu, J. Tilley). Recent Progress in Histamine H3 Receptor Chemistry (R. Aslanian, Neng-Yang Shih). Anti-Resorptive and Anabolic Bone Agents (G.D. Hartman, R.S. Meissner). Inhibition of the Cysteine Protease Cathepsin-K (EC 3.4.22.38)(R.W. Marquis). Nonpeptide Gonadotropin Releasing Hormone Antagonists (Yun-Fei Zhu et al.). Bradykinin B2 Antagonists for the Treatment of Pain (E.K. Dziadulewicz). Selective Cyclooyxgenase-2 Inhibitors (W. Cameron Black). The Discovery of Small Molecule C5a Antagonists (A.J. Hutchison, J.E. Krause). CCR1 Antagonists (K.G. Carson et al.). Recent Advances in Antimetabolite Cancer Chemotherapies (J.R. Henry, M.M. Mader). Mitotic Kinesin Inhibitors as Novel Anticancer Agents (K.W. Wood, G. Bergnes). Recent Advances in Medicinal Chemistry of Histone Deacetylase Inhibitors (H. Weinmann, E. Ottow). Therapeutic Opportunities for the Treatment of Biofilm-Associated Infections (Zhenkun Ma et al.). Biowarfare Pathogens. Is the Research Flavor Different Than That of Clinically Relevant Pathogens? (Ving J. Lee). HCV Antiviral Agents (R.C. Griffith et al.). Pleiotropic Effects of Statins (A. Floto et al.). Comparative Protein Structure Modeling and Its Applications to Drug Discovery (M. Jacobson, A. Sali). Drug Transporters and Their Role in Tissue Distribution (A.H. Dantzig). The Hit-to-Lead Process in Drug Discovery (P. Gillespie, R.A. Goodnow, Jr.). Prodrug Strategies in the Design of Nucleoside and Nucleotide Antiviral Therapeutics (R.L Mackman, T. Cihlar). Pre-Clinical Assessment of Drug-Induced QT Interval Prolongation. Current Issues and Impact on Drug Discovery (B. Fermini, A.A. Fossa). To Market, To Market-2003 (Shridhar Hegde, J. Carter). 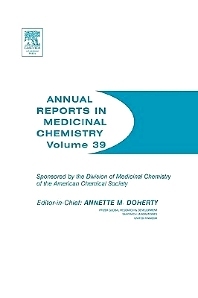 Annual Reports in Medicinal Chemistry continues to focus on providing timely and critical reviews of important topics in medicinal chemistry together with an emphasis on emerging topics in the biological sciences, which are expected to provide the basis for entirely new future therapies. Sections I-IV are disease orientated and generally report on specific medicinal agents. Sections V and VI continue to emphasize important topics in medicinal chemistry, biology, and drug design. medicinal, pharmaceutical and organic chemists.